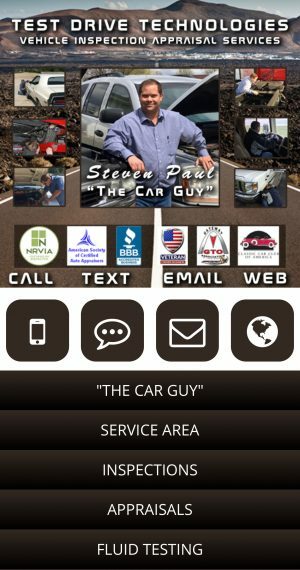 Test Drive Technologies is an independent U.S Army Veteran family owned and operated vehicle inspection company based out of St Rose, Illinois. TDT provides mobile vehicle inspection services to St. Louis Major Metro Area including Southern Illinois. TDT also provides inspection services to Chicago, Kansas City, Springfield and South Eastern Missouri. TDT was founded in 2009 while the owner was inspecting lease return and auction vehicles for Adesa Auto Auctions. After delivering bad news to lessees, Steven decided to create TDT to help consumers avoid purchasing pre-owned vehicles with hidden and undisclosed issues. In July of 2009 TDT performed its first inspection on a 2001 Dodge Viper in Maryville, Illinois. Since its inception TDT has performed over 2000 inspections including current model year used cars, classic cars, exotic cars, collector cars, RVs, motorhomes, campers as well as semi-trucks, trailers, construction equipment and boats. Test Drive Technologies Vehicle Inspection, Appraisal and Oil Sampling Analysis Services in St Louis on all types of vehicles. If a vehicle passes our in-depth vehicle inspection we can also offer an extended warranty vehicle service contract for an additional fee. Our vehicle service contracts are nearly half the cost of the ones sold by dealerships and often have better coverage. Since July of 2009, Test Drive Technologies strives to provide the most thorough and detailed inspection reports, photos and HD video of every vehicle we inspect in the St Louis and surrounding areas. Our vehicle inspection reports are hand built and custom written based on the needs of our customers. Some leaders in the automotive aftermarket and used car sales industries have said that the inspection reports written and designed by TDT are the most in-depth and detailed inspection reports they have ever seen. They have also stated that having as many photographs and HD video coupled with the 12-14 page vehicle inspection report sets TDT well above that of the competition in the vehicle inspection marketplace. Click below for a detailed view of what one of our inspections look like.